Hi, guys! I don’t know what’s with people today but I cannot handle them. Work has brought in a special brand of stupidity and I can’t figure out why. I had someone ask me if we donate our pens. Yes, donate our pens. Time out here, if you just want our pens, take them. Don’t ask, and I probably won’t miss it. Second of all, why would we donate pens. What good do pens do for donation unless it’s specifically for schools? I totally get it if you want our nice pens, I do enjoy a good pen myself, but unless it seems like we’re selling them or donating them don’t ask about it. Even though this week was only a four day week I felt exhausted by the end of it. I had my orchestra concert Wednesday night, and it went well, but it was extremely long. I also woke up with a cold on Wednesday and have had it through today. I can’t wait to be done with it. Thursday I had a senior class meeting where we took a class photo and got our caps and gowns. Except they messed up the gowns so we didn’t actually get them. Thankfully I have mine already because my sister graduated last year so I get the hand-me-downs. Last night I played at senior night for basketball. It made me nostalgic for time that hasn’t happened yet (I must credit this paraphrased line to We Are Okay by Nina LaCour, which I started at the games last night). On the other hand, it might have been the book that was inspiring that mood in me. I went out with some friends after the game and it was fun to see them all again. Last night my friend stayed the night and this morning we watched Gilmore Girls because she hasn’t seen it yet. Anyway, I worked today and then went home because I’m tired and sick. This week’s pretty low key so that’s good. I can’t believe it’s already March! P. S. This was written yesterday and posted today. Oh. My. Gosh. Where do I even start with this book? Well, let’s just say it took me only 2 days to finish this 407 page novel – and I wouldn’t say I’m a quick reader! 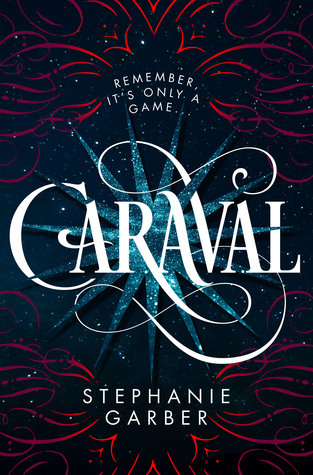 “Whatever you’ve heard about Caraval, it doesn’t compare to the reality. This book is poetry. It is a spell, cast over every single reader. It is majestic, enchanting and truly mind-boggling. Stephanie has created such an amazing world in my head, and it has completely taken over my brain for the past couple of days. It’s more than just a game or performance. For a book with so many twists and turns, I also managed to follow every word. That is truly impressive for me. And for a fantasy book to capture my attention for that long, for so many hours when I should have been doing work, to inspire me to make both a playlist and a mood board (coming Thursday! ), this book is just simply awesome. Also, the romance isn’t cheesy! I’m going to try and do this spoiler-free, but OHMIGOD SHIPPING. SERIOUSLY. I SHIP THOSE TWO SO DAMN HARD. It wasn’t insta love. I didn’t know what was going to happen at any time. All of the reveals in this book came as a surprise – everything was so incredibly original! Okay, so as you know I don’t usually fangirl over a novel, or characters. In fact, I don’t think I’ve ever felt so invested in a fantasy world as I do now. I feel like this book has twisted my mind into loving circuses and carousels and beautiful, twisted cities with rivers for roads. As you can probably gather, I also adored this world. Yes, it was dark and creepy. It was full of secrets and lies. It was twisty, and twisted. But at the same time, it was intriguing and captivating and just truly magical. Stephanie Garber, I don’t know how I’m going to even attempt explain to you how grateful I am for your novel. This has to be the first fantasy I have truly fallen in love with, and is definitely the best fantasy I’ve ever read…and my favourite of the year so far. To put it simply – I LOVE YOU. Oh, and to back up my claims about this book, it’s been out for only 21 days and it already has over 6000 Goodreads ratings. If that’s since the release, over 285 people have rated this book a day. And it has an overall rating of 4.14 stars. That means it has a higher rating than The Night Circus and Red Queen – two of the most famous, most hyped fantasy novels in YA fiction. No wonder everyone is talking about this novel. So, without a doubt this book simply has to be given 5/5 moons from me. Gods teeth, it gets more than that. I’d give it 100 if I could! P.S. UM. THIS BOOK IS GOING TO BE A MOVIE. FOX HAVE OFFICIALLY PURCHASED THE RIGHTS. I’M SO EXCITED!! There are so many next-books-in-a-series coming out and this is one I’ve been looking forward to since I finish A Study in Charlotte last March. 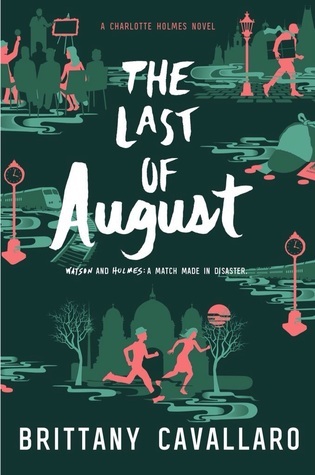 Here I’ll be discussing the sequel The Last of August which was released on Valentine’s day. THERE WILL BE MILD SPOILERS FOR A STUDY IN CHARLOTTE SO PLEASE PROCEED WITH CAUTION IF YOU DON’T WANT TO BE SPOILED. You can find my review of A Study in Charlotte and a discussion on it here. Thank you to Justine Magazine for sending me an advance copy! This novel picks up right where you get left off in A Study in Charlotte. Since it’s been almost a year since I’ve read the first book a few of the details were a bit hazy. I loved refamiliarizing myself with all the characters and getting to know the new ones too. Charlotte Holmes is a fantastic character all around. She is prickly and calculating but that doesn’t make her less. If anything it makes her more. More human, more real. She continues to struggle with the sexual assault that she experienced, and throughout the book it remains a prominent part of her character’s troubles. (I don’t mean this in a dismissive way, sexual assault/violence is something you don’t simply “get over.”) Although this is something that continually gets in the way for her and her attraction to Jamie, it’s something I appreciate reading about. It adds dimensions to her character that I have longed to see in female characters. It speaks volumes to her overall strength as a woman. The book is told mostly from Jamie’s perspective (of course, why wouldn’t Watson be telling the story, honestly). There are a few parts that Charlotte tells, but it’s mostly told from his point of view. I enjoy Jamie as a character. There are developments to his character that I found to be wonderful. He both knows how to be friends with and handle Charlotte, but on the flip side it seems like he’s shooting in the dark. He knows that she can handle herself, but his loyalty and caring spirit win out and he always is looking after her. Their friendship dynamic is a weird one. It’s caught in between just friends and something more, and I don’t mind that it isn’t defined. I can’t wait to see how it plays out in the third (and final) book though. Something tells me the ambiguity will go away and something will establish itself one way or another. Or it could end ambiguously. At this point, they’re so mercurial I don’t know what to predict. The overall plot line was interesting. I like how there were multiple parts interwoven. I didn’t know which one to keep my eye on and when you would forget one it would come back in curious ways. August Moriarty comes into play in this novel, and I grew fond of his character. Though Jamie (very much) dislikes him, I liked reading about a third character upsetting the balance of the Holmes/Watson duo. Why hello there! It’s Saturday and while a lot of the country is freezing, people in my slice of Michigan are out and enjoying the sunshine! I really wish I could be out there too, but I’m stuck inside working. (Not that I mind too much, I love my job <3) I apologize for not blogging on the past two Fridays – I am just a bit out of inspiration for that day lately – if you have any tags, I would love to do them!! This week was a bit of a short one for me at school because we have midwinter break. It’s a nice mini vacation to get us through February and into March. I’m glad for it because I was starting to get a bit restless at school. I had my band’s pre-festival concert on Monday and that was a decent performance. Our director dropped a few beats but we recovered really well. Festival is a statewide band competition for concert season where we perform three songs and get rated on them. Pre-fest is just a way to make sure we’re performance ready and to give us areas where we can focus on for the real deal. Last night I had a few friends over for an impromptu crepe session. I think Maiya ate like 5 crepes? I don’t know but I guess they were pretty good. This week I’ve got to housesit for my friends, so that will be fun. I have a collage concert with my local orchestra. Thankfully it’s a local venue so I don’t have to drive an hour away again. We’re playing Brahms’ Hungarian Dances 5 & 6, Radetzky March, and Finlandia (maybe?). I’m not exactly sure to be honest. Hey there! In light of recent holidays (like Galentine’s day or course) I thought it’d be fun to post this here. I wrote this article for Justine Magazine a while back and if you want to see the original click here. Strong women used to be few and far between, but with people like Michelle Obama and Malala Yousafzai paving the way for others, things are looking up for females. Here are some literary heroines to fuel the feminist pride within you. There are a lot of retellings of A Thousand and One Nights, and of the ones that I’ve read this is definitely my favorite. Shahrzad’s story is one of loyalty—not only to her friend, but to herself, as well. As the plot thickens, Shazi’s verve and strength shine through her willingness to fight to do what’s right. When in doubt, go on a road trip. At least that’s Mim’s solution to her problem. When her father drags her to Mississippi with her new stepmother in tow, Mim feels herself wasting away. When she finds out her mother is sick, Mim sets out to reconnect with the woman who taught her to wear her warpaint proudly. Through her quest to find her mom, Mim encounters detours and people who show her what she is truly capable of. The Wraith and the Heartrender are two of the deadliest people in Ketterdam. These lovely ladies know how to wield knives, be enchantresses and hang with the best of the Barrel scum, all while eating waffles. Inej gathers the deepest secrets crawling all over the city and Nina can bring a man to his knees with a flick of the wrist—without a knife. While they’re only two of Kaz Brekker’s crew, these girls are essential to executing a dangerous heist that could cost them their lives. Charlotte may be a bit prickly when you first meet her, but it’s in her nature as a Holmes to be a bit off-putting. Despite many qualms students seem to have with her, Charlotte never wavers from doing her work and doing it excellently. She follows the trail and and her self confidence is steadfast. Jasmine is what seems to be the perfect girl; she’s cheer captain, valedictorian, the daughter of loving parents. All her life she’s worked hard to achieve the lofty goals she sets for herself. Jasmine is over the moon when she’s awarded a full-ride scholarship from the government to the college of her choice. Her excitement is short-lived, though, after she discovers she’s an undocumented citizen. Suddenly Jasmine must dig even deeper to find strength to fight for what she has rightfully earned. She must decide if she’s going to let someone else tell her who she is and who she isn’t. Charlie is not okay. She has lost herself and cutting is the only thing that makes her feel again. When Charlie wakes up in the psych ward of a hospital after cutting herself to the brink of death, her long journey back to wellness begins. Yet, this story isn’t a sad one. It’s complicated, and she experiences many setbacks, but Charlie’s strong will and hard work lead her to figuring out just who she may be after all. Willowdean is in charge and she is fabulous. It doesn’t matter that she works in a grease pit of a restaurant—she can work that hair net like, well, it’s her job. She has always been proud of her voluptuous body, but when she engages in a flirtation whispers of self-doubt worm their way into her brain. To take her confidence back, Willowdean enters her town’s Miss Clover City beauty pageant. Her stunning performance will inspire you to find body love instead of body shame. Jude may be a bit of an unlikeable character, yet that’s what makes her real. Throughout her life, Jude has felt like she has stood in the shadow of her brother Noah when it comes to art. While she loves him, Jude feels suffocated and rebels. Three years later she’s the one who’s been accepted to the elite art school that they both had applied to, not Noah. Jude doesn’t feel any less lost though, and she must find herself through the real art. Lennie lost her sister, and she doesn’t know who she is without her. She feels like a hollow shell of herself, even reading and music don’t seem to bring her the same pleasure they did before. The only person who seems to understand her is her sister’s former boyfriend Toby. Yet, when she piques the interest of the new boy in town, Lennie feels grounded, for once. He reminds her of the harmony and beauty that were in her life before her sister’s passing. Lennie ultimately must pull herself up and out, and with help along the way she seizes her life back. In the Martial Empire, Laia is a Scholar girl who watched her grandparents’ murder, yet she somehow got away. Helene is one of the best fighters in her class at the military academy Blackcliff, and the only woman. The girls come together when Laia takes on a slave job to help the resistance and save her brother from prison. Soon they’re pitted against each other…Laia the lowly Scholar and Helene the Mask, the highest ranking soldier in the Empire. Despite this, they help each other in unexpected ways. While they certainly don’t part as friends, there is a hint of respect between the two where they find a common goal, emphasizing the strength of women supporting each other. I hope you really like this piece! I had a ton of fun writing this and I’m currently working on two projects for Justine for future publication that I can’t wait for you to read! It’s almost Valentine’s day and what a better way to celebrate that than with a bunch of *new* books? Also, happy Galentine’s day – huge shoutout to all of my lovely ladies, I love you all so much! While it seems love is in the air, the only real love I’m feeling (other than my friends and family of course) is for my books. They’re my escape from this mush-fest this year and have been for several years. I don’t know, I’m a hopeless romantic at heart (right, Ana?). Anyway – make sure you eat a lot of chocolate for me! The sequel to The Thousandth Floor received a title this past Friday – The Dazzling Heights. EpicReads made this grand announcement on their blog along with an excerpt of the book. The Dazzling Heights is set to be released August 29th of this year. So far no cover or description has been given yet. McGee’s first book The Thousandth Floor debuted last August and was quite a thrilling read to many readers. Several made requests to know if there would be a second book, and it’s finally here. Here’s a link to the excerpt! You can add it to your Goodreads here. 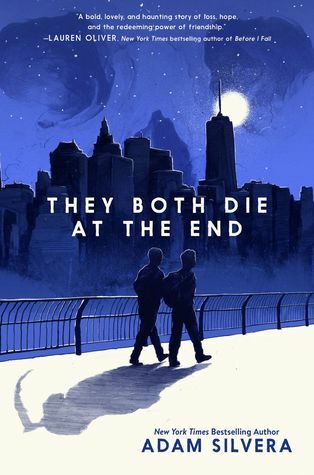 Adam Silvera gave an interview to Mashable about his latest work They Both Die at the End and gave readers a look at its cover. The book is set to release on September 5th this year. This past January Silvera released his second book History is All You Left Me which was a big hit. His debut novel was More Happy Than Not which was received extremely well in the YA community. Synopsis: Set in a near-future New York City where a service alerts people on the day they will die, the novel follows teens Mateo and Rufus, who meet using the Last Friend app and are faced with the challenge of living a lifetime on their End Day. This week Publisher’s Weekly announced the new book deal for Marie Lu and her book The Kingdom of Back. The Legend author announced her excitement over Twitter and shared a few details concerning her new book. That’s all for today folks! I hope you have a wonderful week! Hi there! I’m back at it again with another review this Sunday. 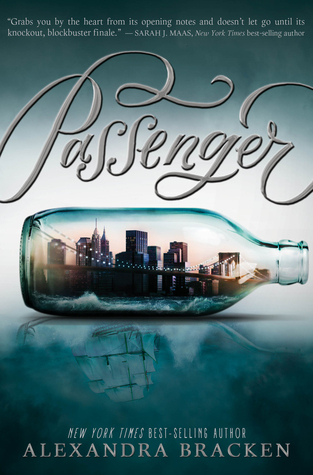 This time it’s for Passenger by Alexandra Bracken. This made quite a splash when it was published last year (the day before my birthday if I may add) and it took me forever to actually read it, but my lovely friend Brittany totally did. I’m so glad to have read it, and I can’t wait to read Wayfarer. I started reading this over Christmas break and I was super excited to get to it. I waited almost an entire year to actually read it and I can’t believe I did. What I loved most about it was Etta and her strength. I’m a sucker for strong female characters, and this definitely delivered. I love different eras and this brought me right to them. I loved how detailed each setting was and how accurate it seemed to be. One of my weaknesses is that I’m a history junkie and learning about them even if it’s through fiction is awesome to me. It’s even better when they’re accurate and to my knowledge this one hits the nail on the head. The story alternates points of view and it’s nice to see both sides of their story. I love seeing people and characters develop through the other characters’ perspectives especially in action books like this one. Music is a huge element in this book and as a music nerd I kind of loved it. The idea of how things that are connected and interwoven through music and that music is a language everyone speaks is beautiful. I love how much it brings people together and that this was a big part in helping Etta especially come off the page. It added depth to the story that I’m not sure it would have had without it. Overall this was a really exciting book. I moved through it at a generally fast clip, but didn’t have much time to sit down and read it. I will say that I enjoyed it when I did get the chance to read it in snippets.